I was amazed when I tried on these jeans. Jeans never fit over my belly button. As an apple shaped girl with a protruding stomach, I grew accustomed to the defeat. Though I love and accept myself, I often struggle with this part of my body. It’s picked on the most by the Internet and sometimes myself. It’s not flat and smooth like other plus size women. This comparison and self acceptance is something I work on everyday. 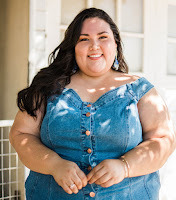 Having never experienced this type of outfit before, I was overwhelmed with joy as I cautiously zipped the denim over my belly button and the largest part of my stomach. To tuck my button down shirt inside of the jeans was even more overwhelming. I gained fashion freedom. I felt that freedom when I wore a crop top for the first time. I felt it when I wore a bodycon dress without shapewear. I felt it when I stopped worrying so much about my VBO (visible belly outline). And I felt it again when I wore these jeans. 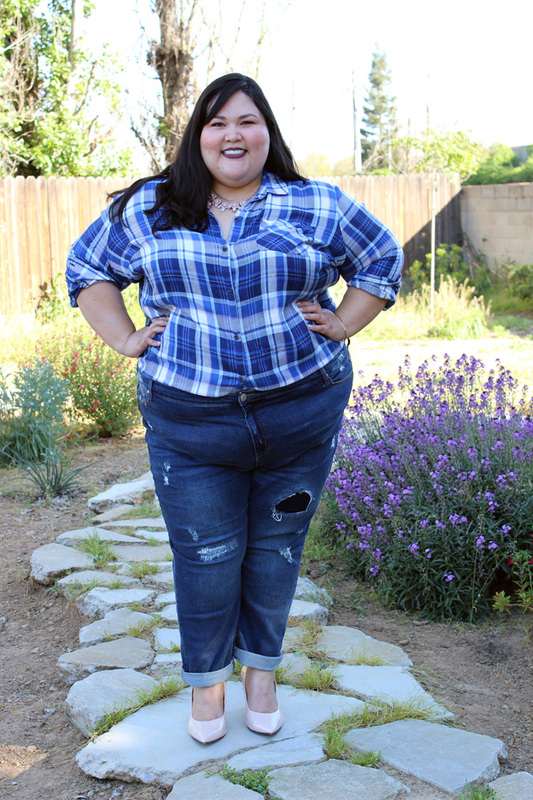 The Hollie Girlfriend Jeans are from Simply Be’s new denim collection. The mid-rise jeans are a relaxed fit with all day comfort and perfectly placed rips and patches. Though they slightly loosen in the thigh throughout the day, I recommend ordering them in your usual size. Available in sizes 8 - 28, the jeans come in a light and dark wash and regular and long length. I’m wearing the dark wash, regular length, in a size 26. 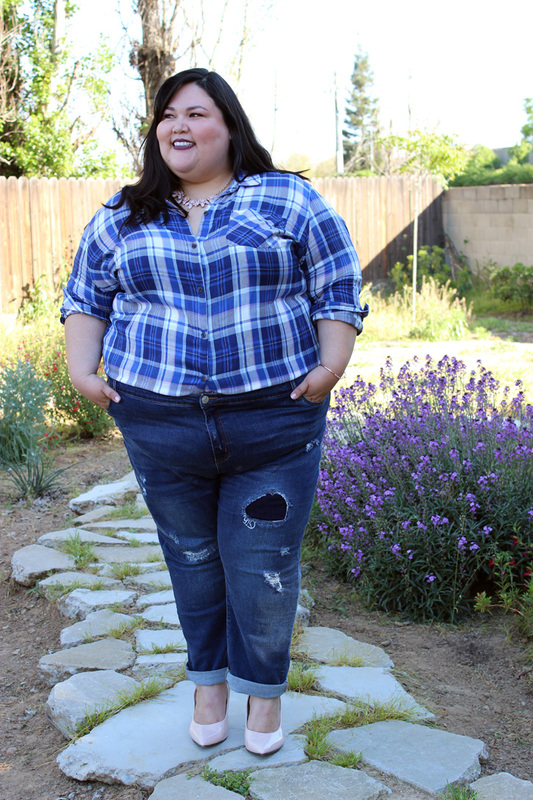 Thank you to Simply Be for sending the denim for review. I am so glad I gave this style a try. It brought me so much happiness and confidence. The power of fashion is so real! The item was gifted for review. All opinions are my own. Love it chica!!! I will have to visit Simply Be's site soon. It's always scary to shop online! Thanks for the recommendation. Thank you so much. I definitely know how you feel. No matter how confident and secure, body image can still be a challenge. That's when loving and accepting yourself come in and help get you through those rough times. You are absolutely beautiful Amanda! Keep your confidence and do YOU!! Gorgeous lady!!! Love it! They look amazing. 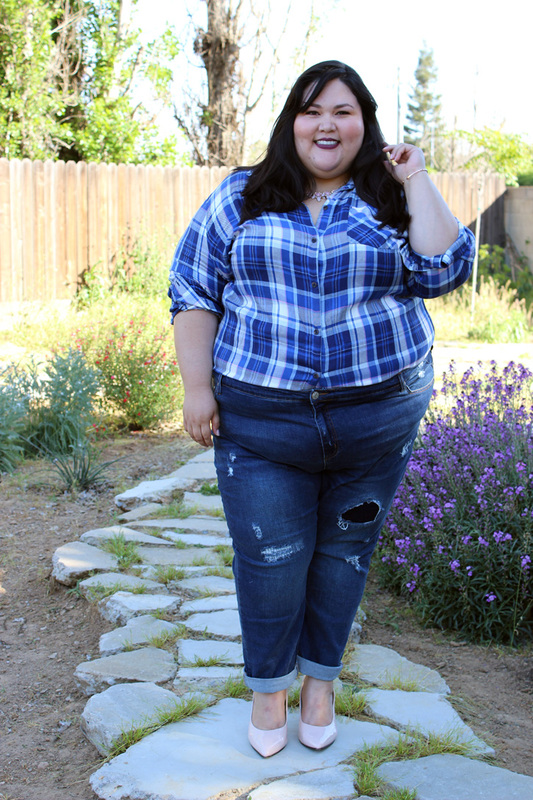 I struggle with the same issue and understand how hard it is to find a pair of jeans! Can't wait to try these out. Keep up the good work. Thanks, Erin! The struggle is so real. I never thought I would find a pair that would fit like this. I was truly amazed. If you try these out, let me know how they work for you. I'd love to hear about it! You are looking Gorgeous and I really like your ripped jeans. Colors are amazing! Shoes suits fine with jeans and blouse. I should also find new pare of jeans...I continue to read your blog, it's really inspiring. I'm older girl who want to learn wear and enjoy of it. Thank you for reading my blog! I hope you continue to find it useful. :) Best of luck in your fashion endeavors!